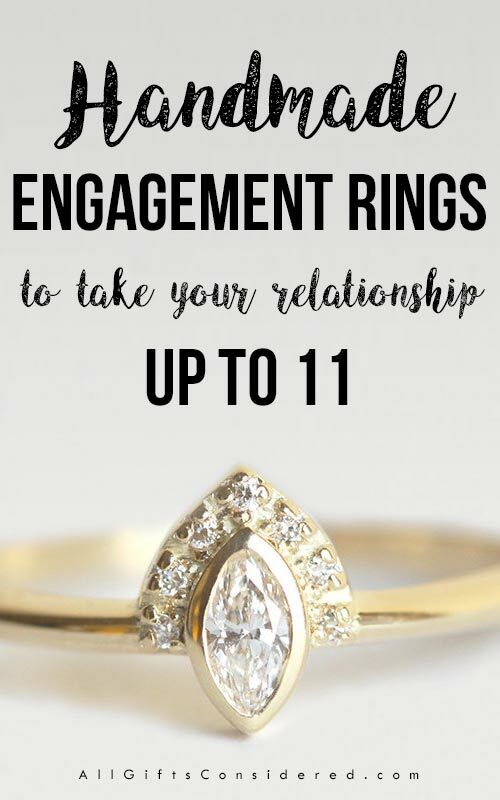 As you bend down on one knee to ask for your beloved’s hand, you want to offer a ring that expresses just how much value you place on your unique, intimate, and treasured relationship. You want something that will ensure that your relationship goes to the next step. You want to take it up to eleven. That’s why you’re not looking at those fancy jewelry shops where everything looks the same. You want something that showcases your sensibilities. Something handmade, something different. You don’t buy in to the De Beers advertising myth that a ring must be a diamond. (However, if your soon-to-be-betrothed has always dreamed of having one, don’t try to buck the trend!) An engagement ring certainly can have one or more diamonds, but it can also have other gemstones or none at all. Maybe it will be made from a real piece of meteorite. Perhaps it will feature deer antlers, or whiskey barrel oak wood. Or both. 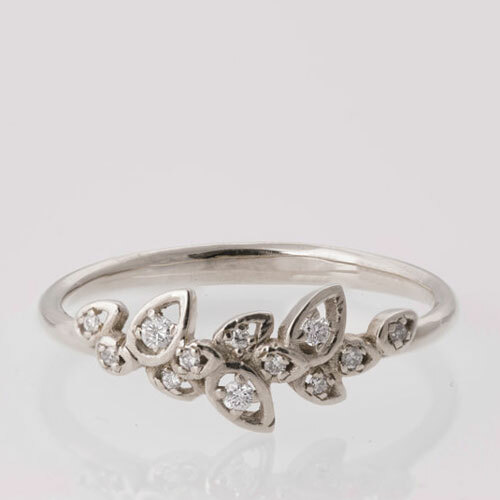 She might adore a one-of-a-kind leafy design, or prefer the natural brilliance of uncut jewels. 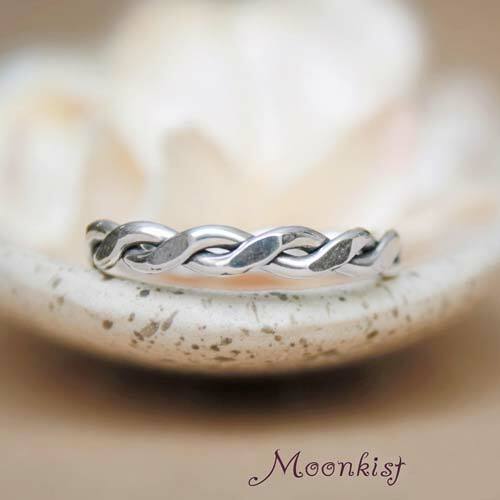 Maybe you both want something simple and inexpensive, but still beautiful. Or maybe you don’t know quite what you want, but you’ll know if when you see it. That’s where handmade engagement rings come into play. 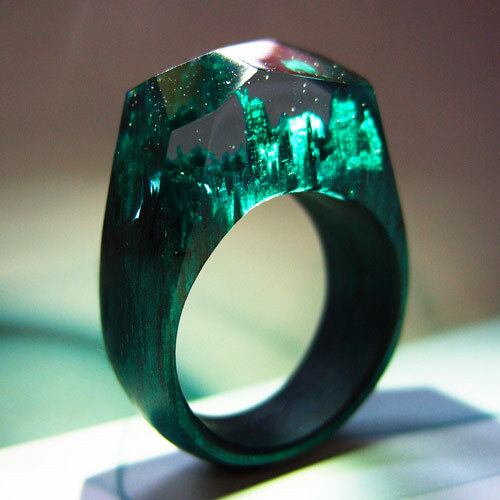 A handcrafted ring is just different from what you will find at a chain store. If that’s where your search is at, you have come to the right place. Some of the engagement rings below are affiliate links, which means that – at no cost to you – we may get a small percentage of orders placed after finding the item on our site. That helps keep this blog up and running. 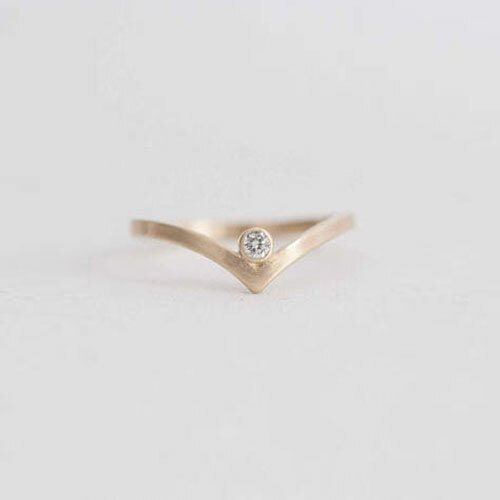 These handmade engagement rings will take your relationship to eleven. They’re the best of the best, and your beloved will know how you searched high and low to find just the right ring. Seek and ye shall find! 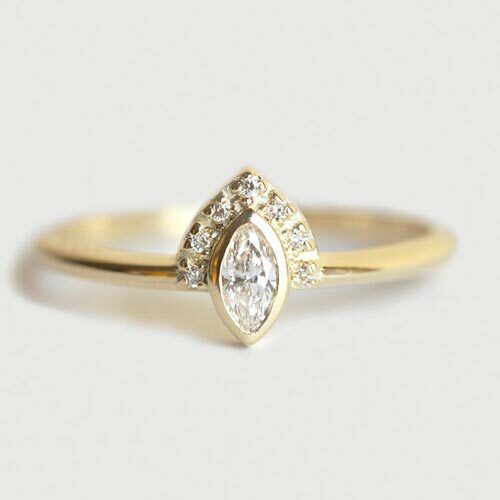 Not only does the raw/unaltered diamond engagement ring have an organic beauty and a trendy BoHo sensibility, it’s also pretty darn affordable. 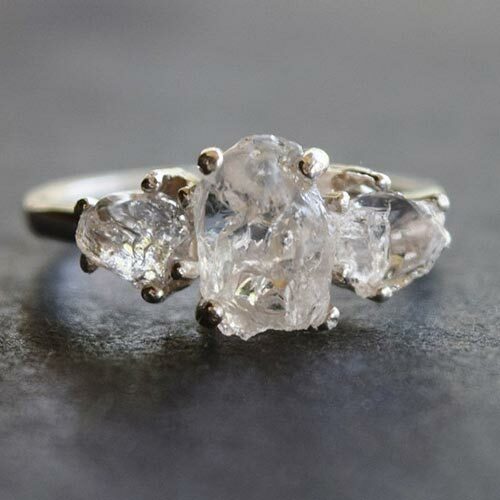 Handmade in Willis, California, from prized Lake County Diamonds. 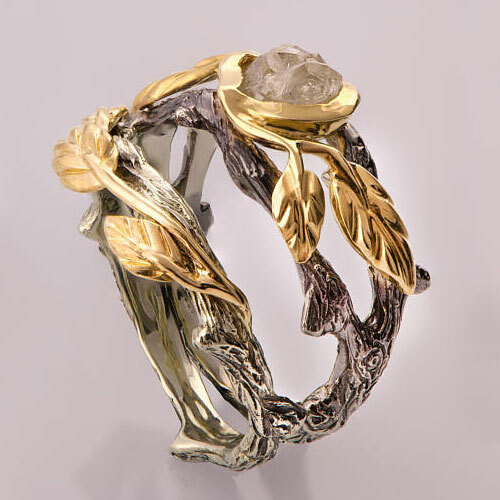 Raw diamonds set into an earthy twig and leaf design, which sets two colors of 14 karat gold in apposition to swirl around the engagement rock. From Capucinne, a renowned jewelry maker in Ljubljana, Slovenia. Marquise diamonds set in a fan-like pave across the top of the piece. 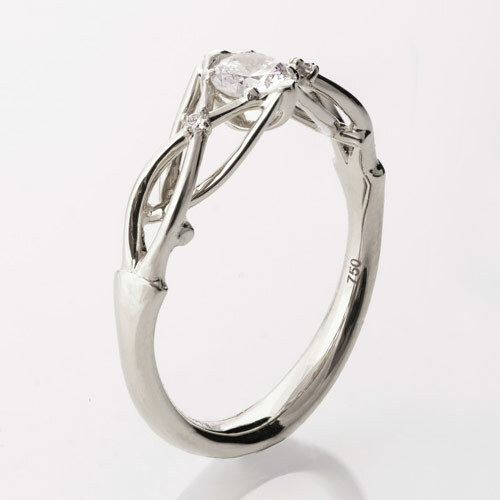 Wonder, majesty, and elegance wed in this stunning ring. Engagement ring blossoming with pristine beauty. Handmade in Israel using 100% recycled gold, each piece a unique work of art for your beloved. Graceful elegance for your princess, a true beauty. Individually handcrafted in Chicago, Illinois. The lovely princess V shape, with more diamonds. Handmade using recycled gold, perfect for stacking. 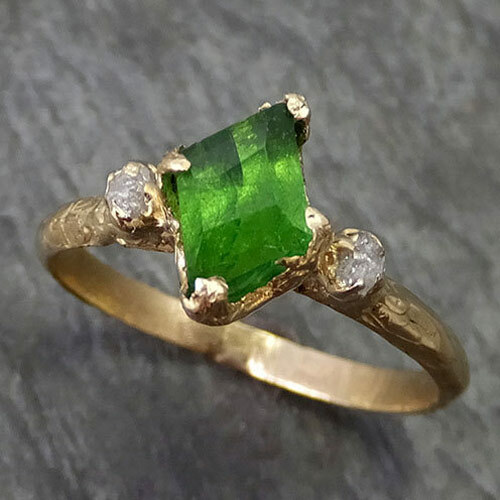 The rough cut of the tsavorite green gemstone gives this piece a sense of rugged authenticity. The natural colors of the greens and golds complement each other. At the same time, the organic rustic look of the holdings create a natural, earthy engagement ring that you will be proud to hold up from one bended knee. 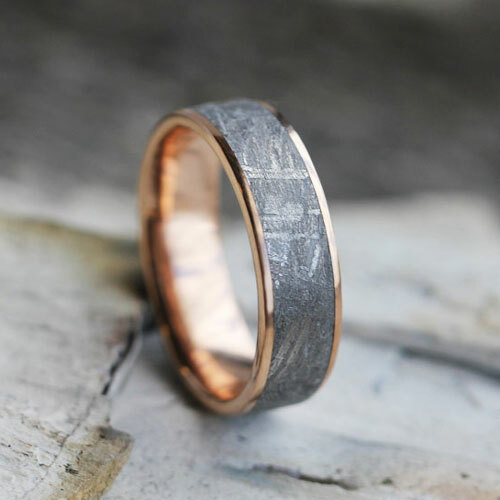 From the outer reaches of the universe to the promise of your everlasting love, this rose gold engagement ring is handcrafted in Woodbury, Minnesota from the famous Gibeon Meteorite of Namibia. 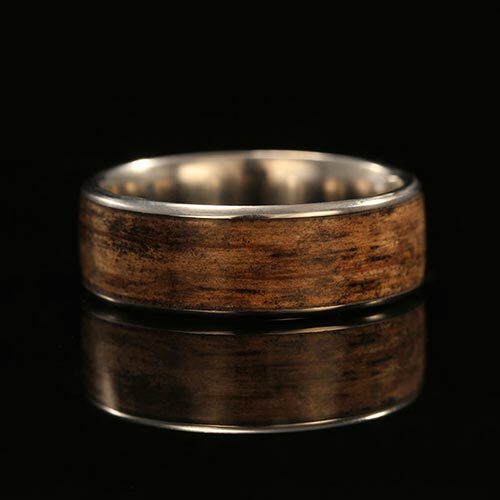 Yes, you read that correctly: this stunningly gorgeous engagement ring is handcrafted from a combination of genuine deer antler and oak from whiskey barrels. This earthy titanium ring is handmade to order in Redding, California. Inlaid with reclaimed whiskey barrel from the famous Jack Daniel’s Tennessee Whiskey company. 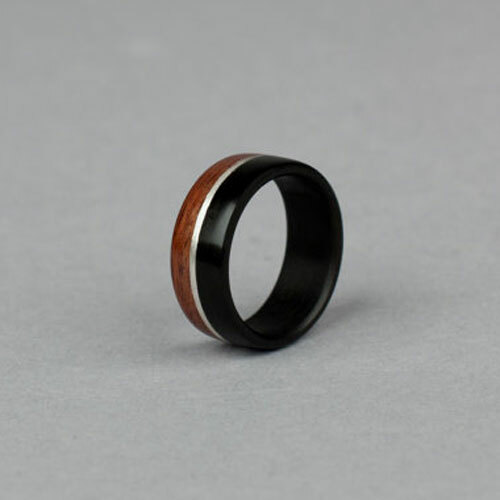 Argentium silver is set into ebony and sapele brentwood. Argentium is more pure than “traditional” sterling silver (935 vs, 925) and does not tarnish. Handmade in Slovenia. A West African tree which is typically tapped for rubber, untapped etimoe produces a beautiful hardwood with similarities to rosewood. Combine it with cherry and a bright splash of turquoise inlay, this is the perfect alternative handmade engagement ring for earthy lovers. A 14k yellow gold band with matte finish. Six brilliant diamond accents. 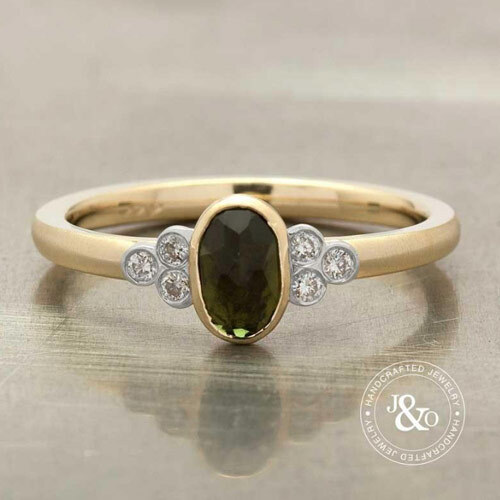 A centerpiece of green tourmaline in a classic oval shape. 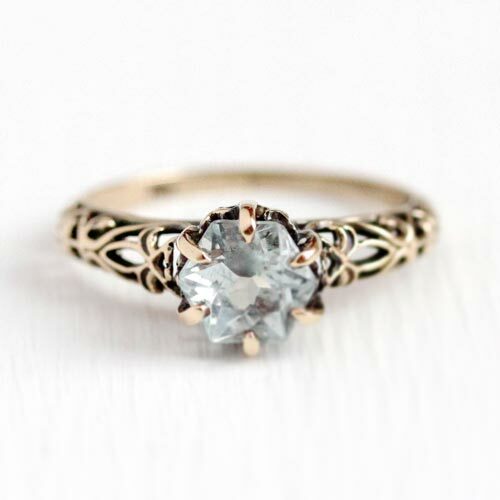 The perfect handmade engagement ring. Here’s a unique way to say ‘Til Death Do Us Part. Mourning rings featuring a lock of the loved one’s hair is traditionally a post-death thing. But if you’re planning on being together always, why not get a jump start on it? Weddings and funeral actually have quite a bit in common. There’s even a wedding-at-a-cemetery trend, and you can see how this theme can be done beautifully and with taste. 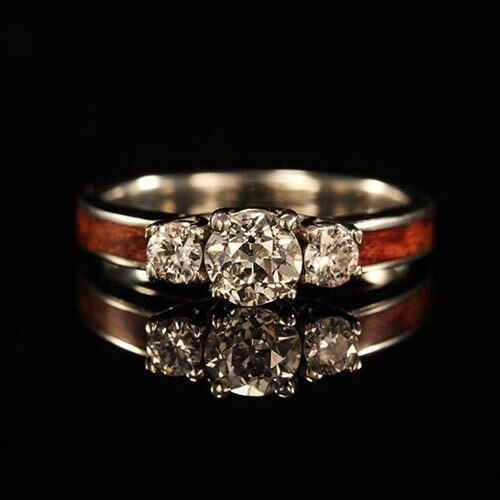 But before you pop the question with a ring like this, you’d better be pretty darn sure you’re both on the same page! 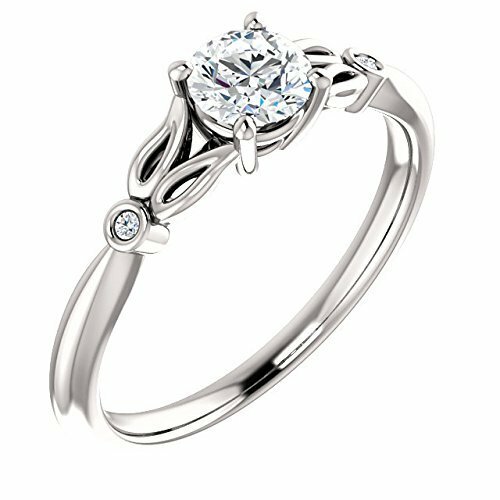 Crafted by hand with Celtic swirls of love holding up a 0.3ct clear center diamond plus two 1.4mm diamonds. 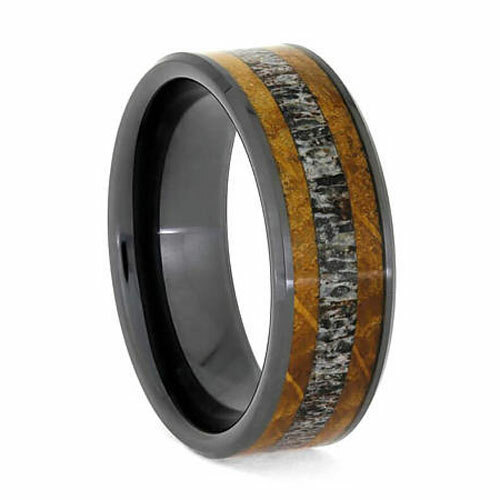 Bubinga wood inlays in 14k white gold provide a rustic foundation for the three engagement rocks. The center diamond is 5mm and also GIA certified, with the surrounding stones at 3mm. This split shank ring is in a class of its own. Made with conflict-free diamond in the weight of your choice. Just look at it! Stunning. She’ll say yes. Going vintage is another way to get a one-of-a-kind ring. Many vintage items are handcrafted in the old school style, and you will be hard pressed to find anything like it elsewhere. Addy is based in London but will ship worldwide. International = unique! 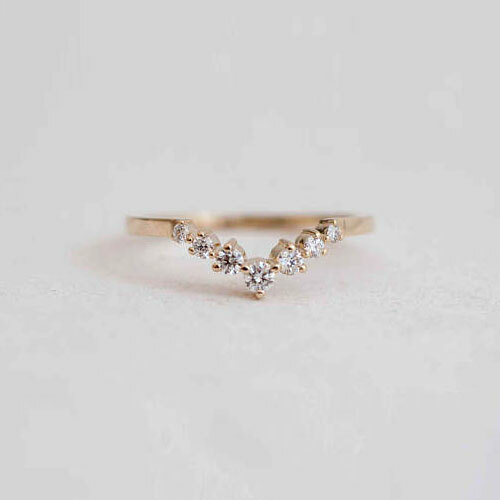 Here are some of our favorite handmade engagement rings that will set you back less than a hundred bucks. Sometimes you need to play it smart by staying within your means. The proof of your love doesn’t have to be how much cash you can blow on a rock. Rather, sometimes the perfect ring for your engagement is that hard-to-find-hand-crafted-one-of-a-kind quirky, cute, or simple & elegant ring that is handmade just for her. 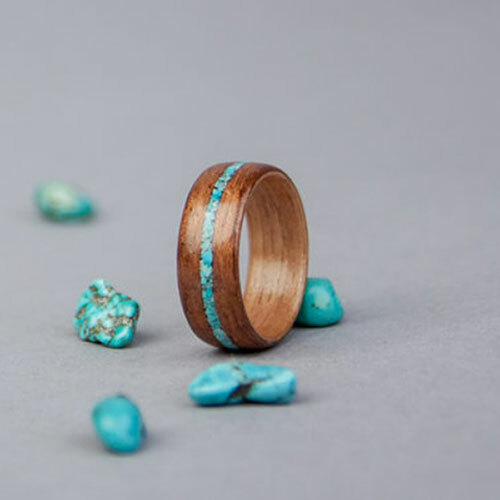 Handcrafted in Russia, these wood rings are carved by hand and topped with jeweler’s resin to create a “secret world” on your beloved’s ring finger. 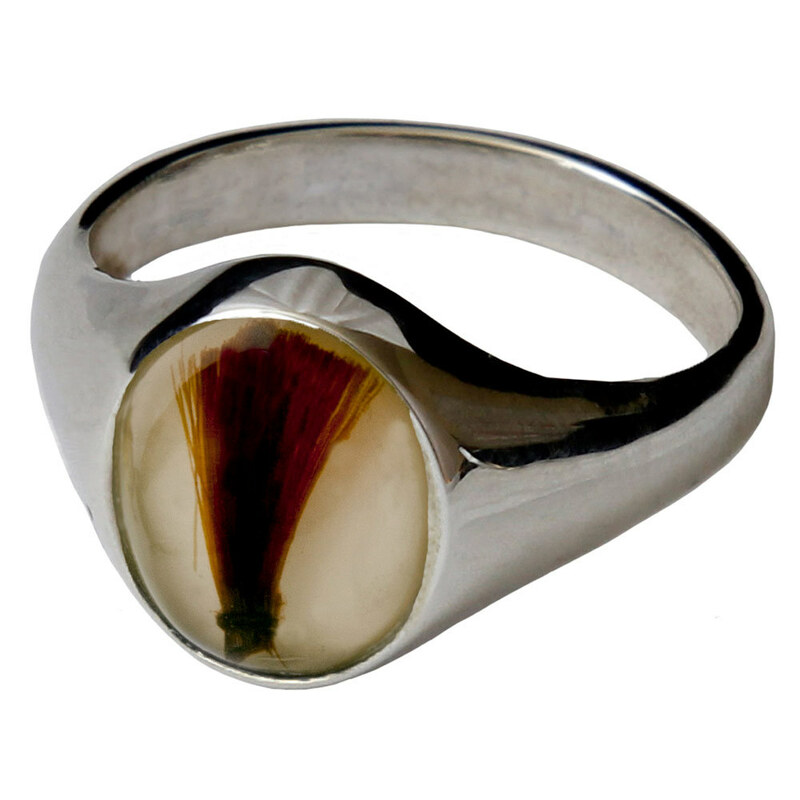 These unique rings have a lifelike feel of nature and otherworldliness. 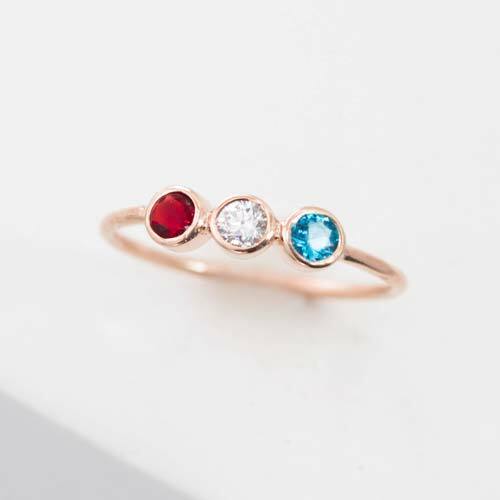 These delicate handmade engagement rings feature your choice of three birthstones. A true bargain that is delicate yet ornate. For use as an engagement ring, you could place a diamond in the center with your birthstone to one side and hers to the other. 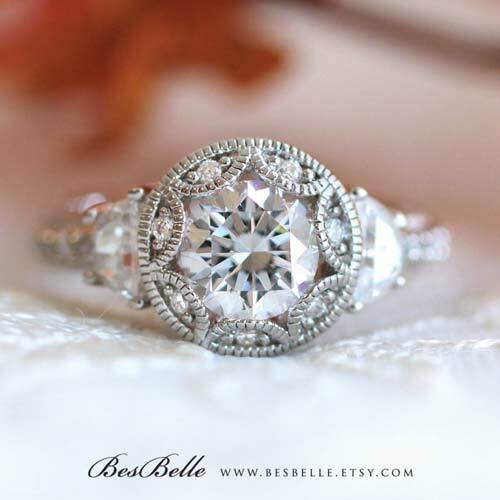 Brilliant, ornate, handmade, yet still somehow very affordable, this handcrafted engagement ring is sure to thrill her heart. Forged by hand from sterling silver in an enduring “Eternity Twist” design, this handmade engagement ring is simple, pragmatic, and affordable. And yet… and yet, somehow it still looks and feels like it is bursting with everlasting love and passion. It’s just right. It’s kind of a tradition for the guy to “pop the question” as a surprise. To do so, you need to know the beautiful lady’s ring size in advance. This is especially important when you are considering handmade engagement rings. There are a few options to secretly and sneakily obtain her ring size, let’s check them out. This is a bit lame, but it works. Just get a ring that’s close to her size, and then take it in afterwards to fit it correctly. The bummer about this is that, if the ring is too small, she won’t be able to put it on after saying “yes.” Or, if the ring is too big, it will flop around loosely. On the suave scale of Pee Wee Herman to James Dean, this option is about a Ron Weasley. Find a ring that you know she wears, just not all the time. Take it in to a jeweler and bam, you’re don. If you’ve done the gallant thing and asked her parents for her hand, this should be a piece of cake. Sometimes mom already knows, other times she can find a way to sneak a ring. Other options aside from her mother include sisters, roomates, BFFs, and co-workers. Grab her favorite ring when she takes it off for a moment, and trace the inside. Take this in to a jeweler and they should be able to get the size. I personally don’t recommend this one. She’ll pick up on it way to fast. But, if you’re the daring type, give it a go. Try to casually steer the topic towards ring and finger sizes. Buy her a cheap gift ring from a street vendor at a Saturday Market, and pay attention to the size. Say you’re looking for a gift for your sister or mom, and that you think she has a similar ring size. But don’t be surprised if she sees right through these! The ring bearer can carry the rings on a pillow, if you wanted to go the traditional route. But you probably don’t. 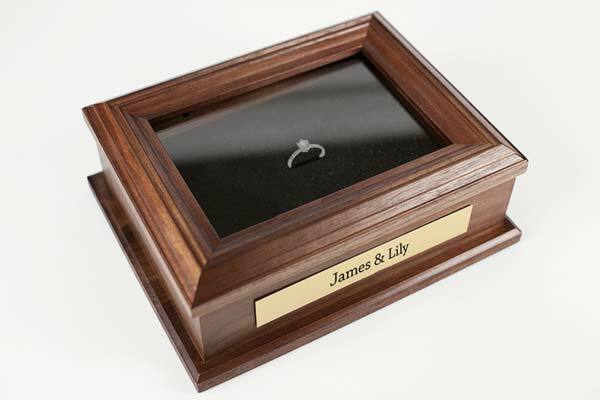 So have the ring bearer bring in this gorgeous walnut wood ring box, custom engraved just for the wedding.